MyOwn is new to the world of health funds. It’s the child of AIA Life Insurance and the non-profit health fund GMHBA. AIA brought their healthy-living rewards program to all health insurance plans through myOwn, which is one of the biggest features of their coverage options. Since these companies only created myOwn in 2017, there isn’t too much data on how the fund performs. GMHBA has an 80-year track record, though, so we can take some insight from their history. Are you willing to jump on the myOwn train early? Take a look at the guide below to find out if it’s the right fit for you. There are a few features that set myOwn apart from the competition. They offer multiple options for coverage, as well as AIA Vitality that rewards you for healthy living. You can choose the most basic hospital cover that only protects you from injury or myOwn’s top option that covers everything – including pregnancy. MyOwn includes their AIA Vitality program with all of their hospital cover plans. Even the least comprehensive plan will grant you access to the AIA Vitality rewards. AIA vitality rewards its members for making healthy decisions and improving their health. As you hit milestones, you will rise through the program and receive enhanced discounts from their partners. You will also receive an automatic 5% premium discount as long as you keep your AIA at the silver level. MyOwn allows you to choose a variety of hospital cover options. You can also decide to bundle some extras with your hospital cover, but it does not appear as though you can select extras-only options as you can with some other health funds. Hospital only cover excludes any extras cover. If you want some or all extras covered with one of these plans, take a look at the package options in the “Hospital and Extras” section below. Accident only cover is the cheapest and most basic hospital policy from myOwn. They designed the plan for those who only want private hospital cover to protect them from injuries. As the policy’s name suggests, the only procedures that are covered are treatments stemming from an injury. This includes any palliative, rehabilitation, or psychiatric care you might need if you suffer a serious accident. You can also receive conditional ambulance cover with this plan. Basic Hospital is the next step up from accident-only hospital cover. It’s still affordable, but the coverage isn’t limited to only accident treatments. With the Basic plan, you will be able to receive cancer treatment, brain surgery, joint reconstruction surgery, hernia repair, colonoscopies, certain emergency dental surgeries, appendix removal as well as a few additional procedures. With this plan, you will get all of the benefits of the basic package as well as full rehabilitation coverage, podiatric surgery, cardiac-related procedures, and cochlear implants. Comprehensive cover is best for those seeking health insurance that will cover a full range of possible ailments. The only exclusions in this plan are pregnancy and reproductive assistance, so it’s ideal for someone who wants peace of mind but doesn’t plan on having kids. The hospital and extras packages allow you to bundle extras with your hospital cover to receive a discount on the extras. You’ll obtain access to the plan of your choice with the corresponding extras package we’ve detailed below. The Accident Only Package gives you 50% back on a few select extras. The extras included in this plan are general dental, preventive dental, optical, physiotherapy, hydrotherapy, myotherapy, chiropractic, acupuncture, and remedial massage. If you prefer, you can choose the plan that gives you 60% back on extras with more of a limited selection. This plan includes major dental but excludes acupuncture, massage, and chiropractic procedures. 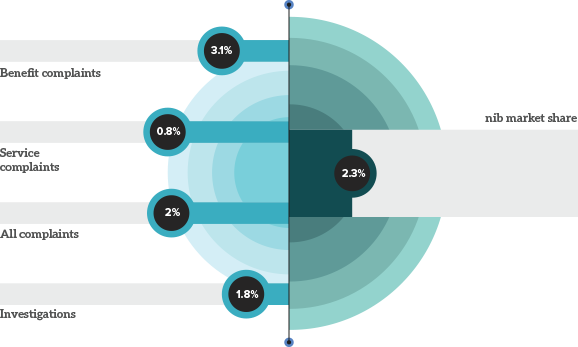 There are also 65% and 70% accident-only options, which give you the same list of extras like the 50% plan for a slightly higher monthly premium. The Basic Hospital package allows you to choose basic hospital cover with a range of different extras. You can decide you want minimal extras to cover optical, dental, massage, etc. On the other hand, you can choose a more comprehensive extras plan that only excludes a handful of treatments. These plans are available in 50% – 70% cash-back options. The Mid Hospital Package options are similar to those of the Basic package. This plan will give you the Mid hospital cover, as well a choice in the level of extras you receive. With the more comprehensive extras plan, the only exclusions are antenatal and postnatal care and orthopaedic appliances. As with the basic plan, you can choose to receive 50% – 70% back on extras. There are only two Comprehensive packages available through myOwn. Both give you full hospital cover (excluding pregnancy-related care) and access to the full range of extras. You will get either 60% or 70% back on extras with these two options, and the only exclusion is antenatal and postnatal. The 60% option excludes orthopaedic appliances as well, but you can select the higher comprehensive plan if this extra is important to you. The Top Hospital package offers all-encompassing coverage with very few exclusions. The “Medium Extras” plan excludes antenatal and postnatal, but for a few more dollars per month, you can receive 70% back with 0 exclusions across the board. MyOwn is one of the youngest health insurers in the country. It was only created in 2017, and there isn’t much data on how myOwn stacks-up against the rest of the industry. Fortunately, we can gauge the performance of myOwn based on one of their parent companies, GMHBA Health Fund. 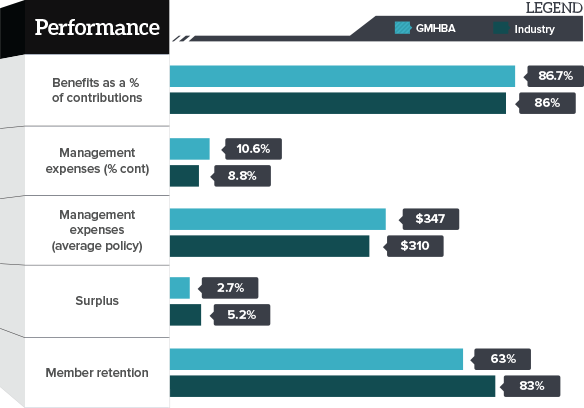 Ahead is a breakdown of how GMHBA compares to the rest of the health insurance landscape. Keep in mind that myOwn might not perform the same way as GMHBA. We still need more data before we can make any definitive conclusions on myOwn’s performance. Electronically: If you have extras cover, hand your membership card to your healthcare provider. All you need to do from here is pay the difference. Online: Visit the myOwn online portal with your receipt and login information to make a claim online. By Post: Fill out a claim form and send it to myOwn with a receipt, or bring the claims form and necessary information to your local Medicare office. One of myOwn’s leading promotions is with AIA Vitality. This program rewards myOwn members who take steps to better their health. You’ll receive a variety of discounts as you advance through the AIA Vitality program. We included a brief breakdown of how myOwn with AIA Vitality works below. AIA Vitality rewards you with points for healthy-living decisions. They rank you from bronze to platinum, and your discounts correspond with your rank. Silver: At 10,000 points, you’ll get 30% back on your flights, 30% off Edota Spa treatments, and 5% off your health insurance premium. Gold: Gold level starts at 20,000 points. Here, you’ll jump up to 40% on the previously mentioned deals as well as the 5% premium discount. Platinum: Platinum is the highest level in AIA Vitality. You reach this at 30,000 points, and your discount will rise to 50%. The 5% premium deal still applies.